A cabochon is also sometimes spelt as cabouchon. It is sometimes referred to as just a cab. And sometimes it is incorrectly spelt as cabochan. So what is a cabochon? Cabochon, traditionally, was a gemstone that had been shaped and polished, but not facetted. Nowadays, it also comes in other materials like cat's eye (optic fiber) and polymer clay. Cabochon also refers to a method of cutting .. namely cutting a bead or gemstone with a convex, polished, rounded surface without any facets. It also normally has a flat bottom. The "en cabochon" (also called cabbing) cut is more often applied to opaque gems than transparent stones. (Facetting is normally applied to transparent stones, most notably, diamonds). In fact, opaque, asteriated, irridescent, opalescent, or chatoyant stones are very suited to having an "en cabochon" cut as the cut brings out the interesting features of these types of stones. The stones that fall into these category includes garnet, jasper, bloodstone, moonstone, cat's eye, star ruby, and sapphire. Particularly with cat's eye, the domed shape of a cabochon cut brilliantly highlights the star or eye of the fiber optic bead; which would not be visible in a facetted cut. The back of a normal cabochon-cut stone is flat, but with some stones, it may be hollowed out to lighten the colour. The bottom is either polished or sanded. A flat back makes working and setting the stone easy. Though the cabochon form of cutting is frequently used for opaque and translucent stones, it is also very effectively used for transparent materials that contain too many inclusion to yield a good facetted stone. Coloration and patterning provide the major interest in such stones. The cabochon form of cutting is simple but it can totally transform the look of a piece of rock, bringing out the magic of unique shapes and lines in the rock. The most common shape of a cobochon stone is traditionally oval but a cabochon can come in a variety of shapes - ovals, rouds, teardrops, diamonds, squares. Some jewelers cut their cabochons in irregular shapes which are designed to showcase certain features of the individual rocks. The cut may also vary in siaze from quite small, for use in earring and rings, to very large, in the form of a centterpiece on a necklace or brooch. 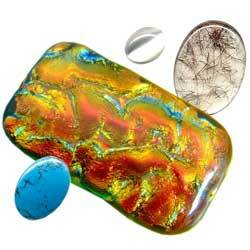 A rock which has been cut into a cabochon may be described as en cabochon, or it may just be called a cabochon.